Here’s the 200th post! I can’t believe it… I finally made it to 200 posts! It really took an incredible long time for me to reach this milestone – I started this way back in 2008 and I know there are many people who actually managed to post 100 recipes in just 1 year, so I’m really, really slow in this aspect. But well, it’s better late than never, right? One of the reasons why I didn’t shut down the blog was because I felt that it’s kind of a waste as there are many recipes that I really liked that were kept here. It’s like a food memory for me – and I could retrieve any of my favourite recipes whenever I want. And now this blog serves as a travel memory for me as well! But of course, the main reason why I didn’t give up are because of readers like you. I’m really happy, fortunate and glad to know that there are many who read my blog, and many who tried and liked the recipes I’ve shared here. It became a goal for me – to share plenty of easy (sometimes complicated) and delicious cakes, cheesecakes, cookies, muffins, cupcakes, pastas and meatballs‘ recipes that everyone will like and willing to try. And I’m glad I did persevere on! And of course, how can I forget my foodie friends? This Tiramisu is made and dedicated to all of you (but sorry I have to enjoy them on your behalf). :p It is my favourite dessert to whip up, though I don’t make them often as mascarpone cheese is quite pricey here in Singapore. And if I make them often, I would definitely gobble all of them up (and not sharing with anyone at all sharing with only a few people) and this is soooo disastrous to my waistline! 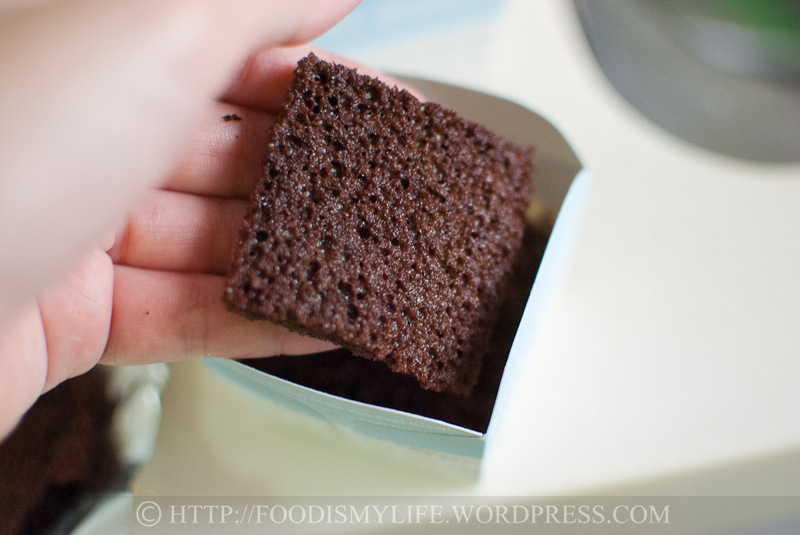 I’ve always used Savoiardi when I make Tiramisu, but this time I decided to use a chocolate genoise as I can cut the genoise into whatever shape I like to fit into the mini containers I’m using. 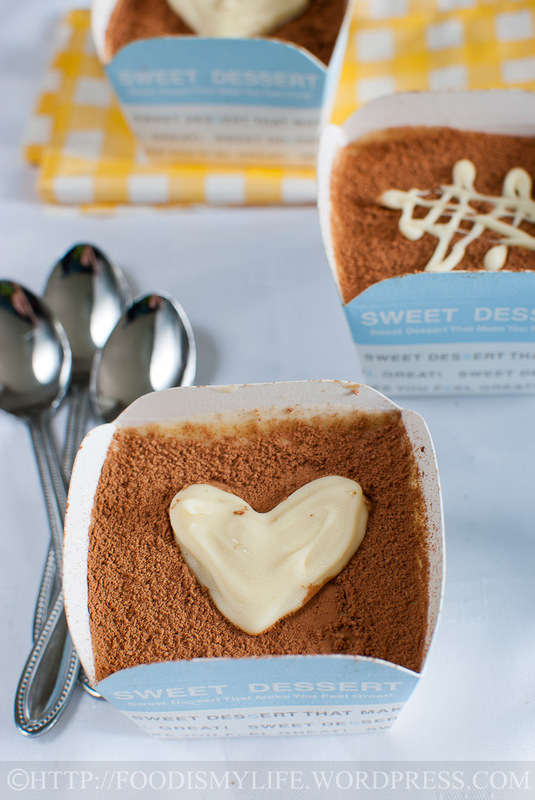 So without further ado, here’s the step-by-step photos for the perfect combination of cream, sweet cheese, coffee and chocolate! 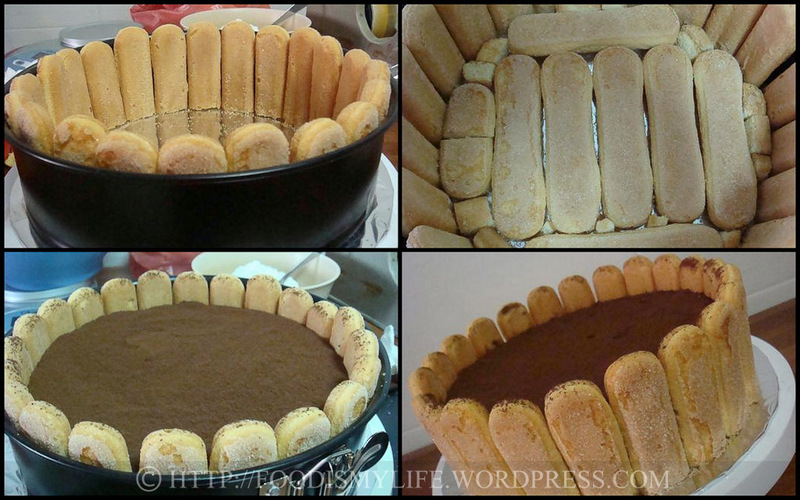 (The step-by-step photos feature only the making of the Tiramisu Mix and the assembly. First brew some espresso coffee, dissolve some sugar and let it cool completely to room temperature. I love how the whole house smell of coffee when I brew espresso! 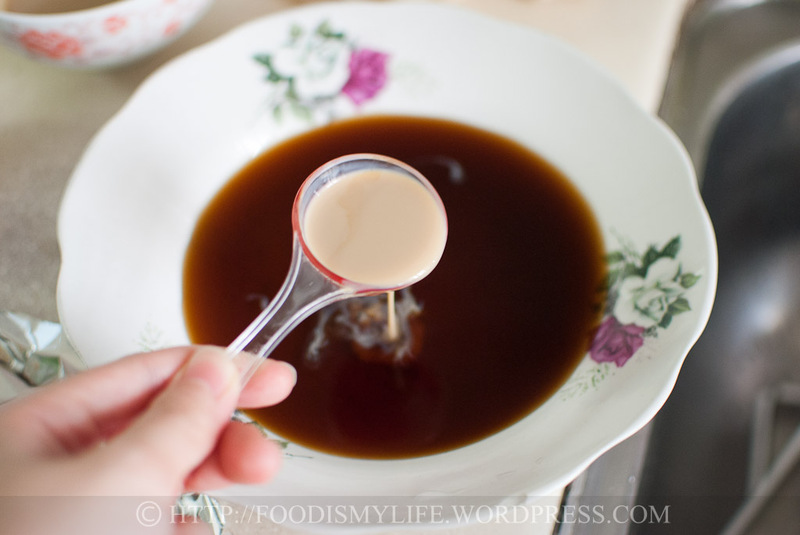 Transfer the coffee to a shallow plate and stir in Baileys. Next, chill your bowl and beaters very well. Then pour in some cream. I like to place the bowl in the fridge and the beaters in the freezer. The cold bowl and beaters makes whipping the cream an easier task! 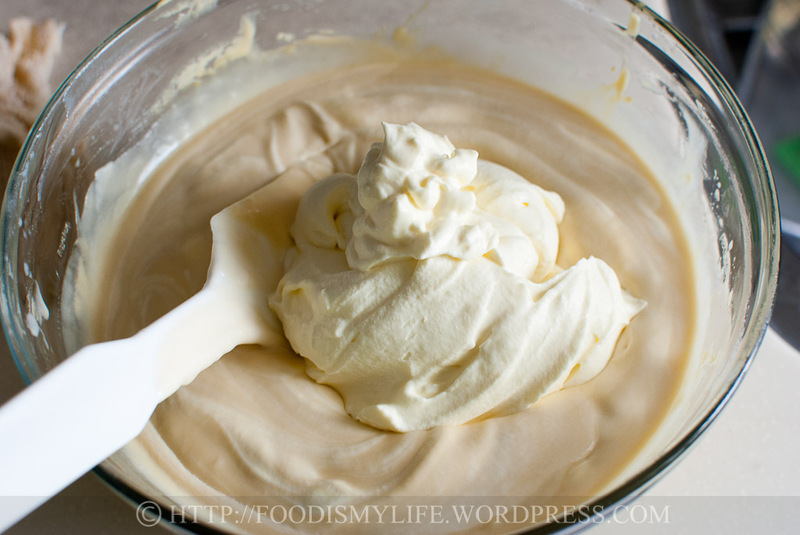 In the past I did not know that cream must be whipped while it’s cold – I had even left the cream to warm to room temperature before whipping. So, so, so foolish. I ended with plenty of split creams, which was a very costly experience! Whip the cream till soft peaks formed. Chill the cream in the refrigerator while preparing the other components. In another mixing bowl, measure some room-temperature mascarpone cheese. Add in some superfine sugar. Superfine sugar are just regular granulated / caster sugar being grounded into a very fine powder in a food processor. It’s different from icing sugar / powdered sugar as these two more than likely contains corn flour. Using superfine sugar is great as it allows them to be dissolved into the mascarpone more readily! 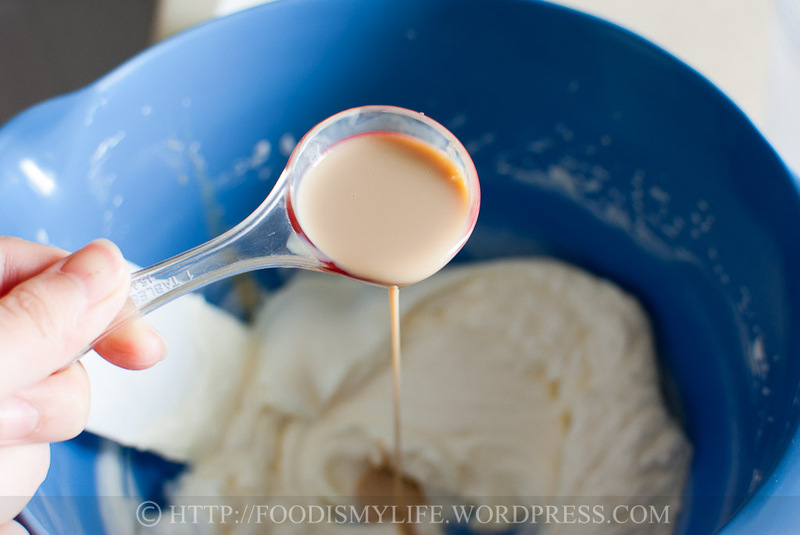 Beat with an electric mixer till light and fluffy, then stir in more Baileys. Set aside while you prepare the last component. 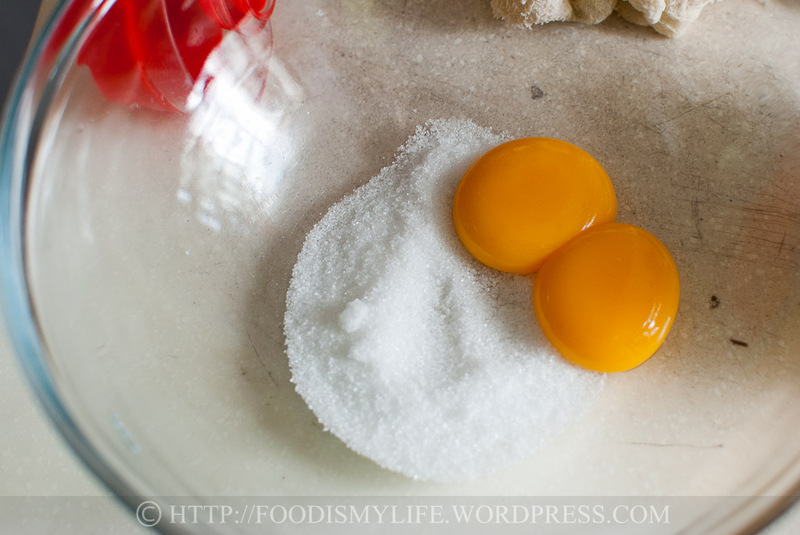 In a heatproof bowl combine fresh egg yolks and sugar. 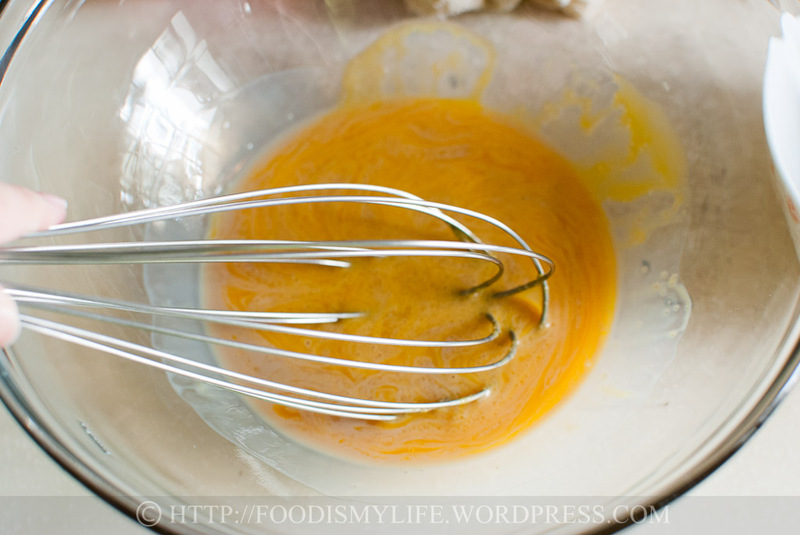 Whisk lightly to roughly mix them together. Place the bowl over a pot of simmering water and whisk constantly! Whisk and whisk and whisk until the mixture thickens and leaves a trail when lifted from the whisk. Remove from heat and continue whisking until it has cooled to room temperature. 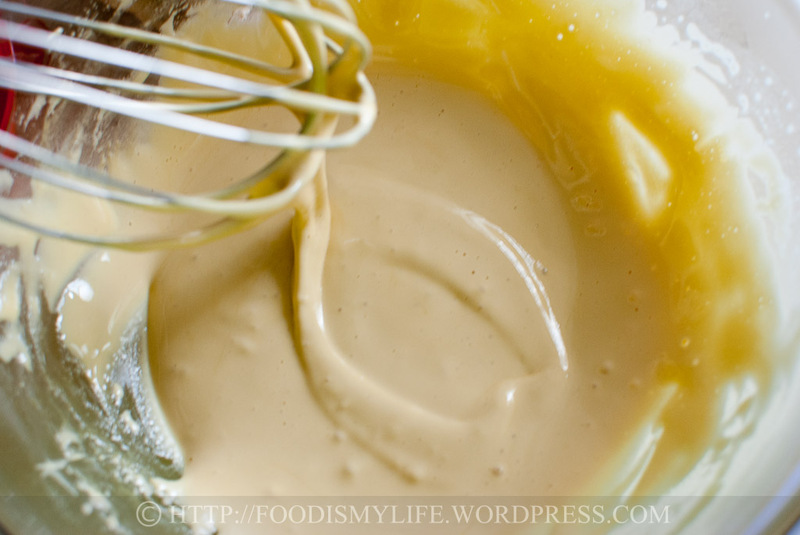 Make sure it is at room temperature so that your mascarpone won’t split when added into the egg yolk mixture! 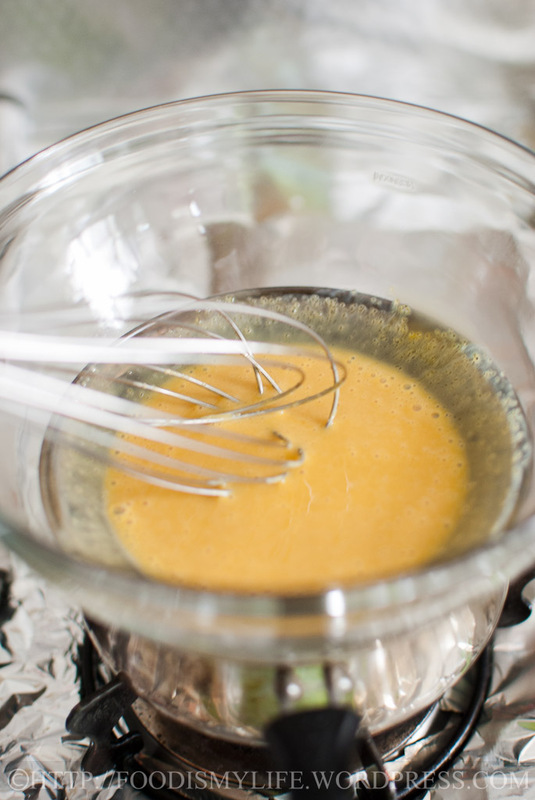 Fold in 1/2 of the cheese mixture into the cooled egg yolks mixture as gently as you can. Then in goes the other half – just look at the volume! 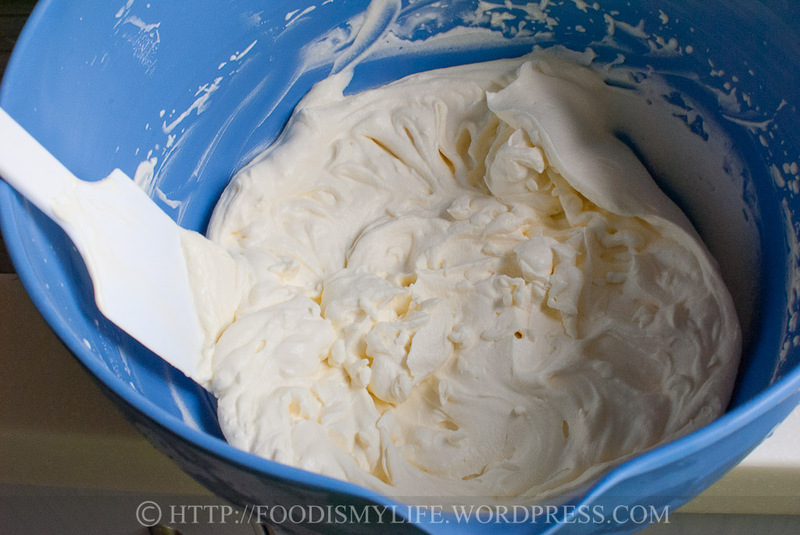 The whipped cream goes in next – similarly, fold it in in 2 batches. 2nd batch of whipped cream added in. Try to resist from scooping it and eating it immediately! Grate some good quality dark chocolate! 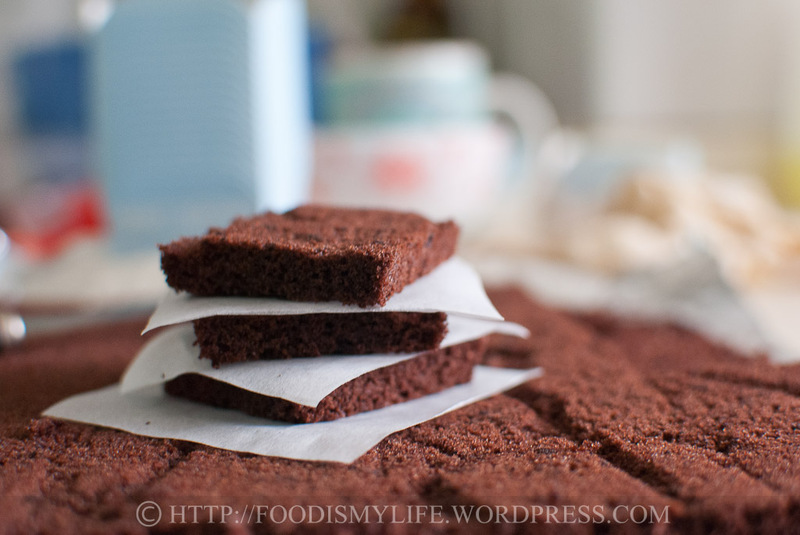 If you’re lazy or don’t have the mood to grate, just use cocoa powder! 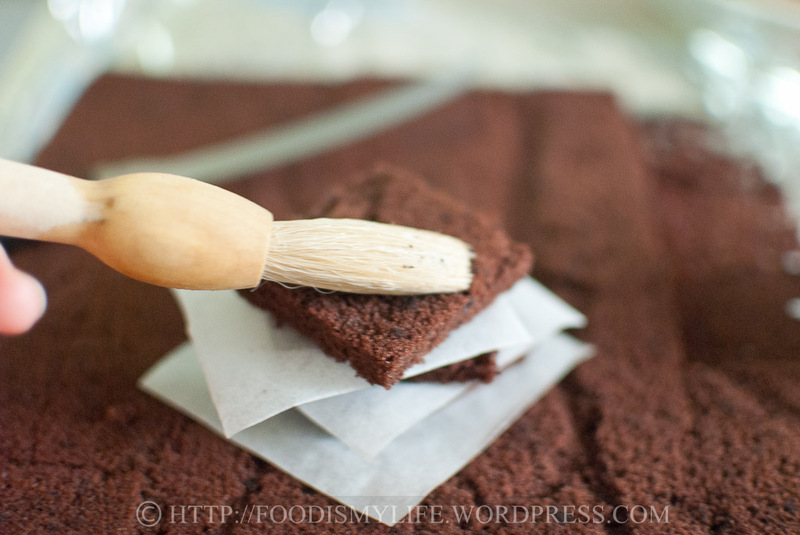 The genoise – all cut up and ready for assembly! 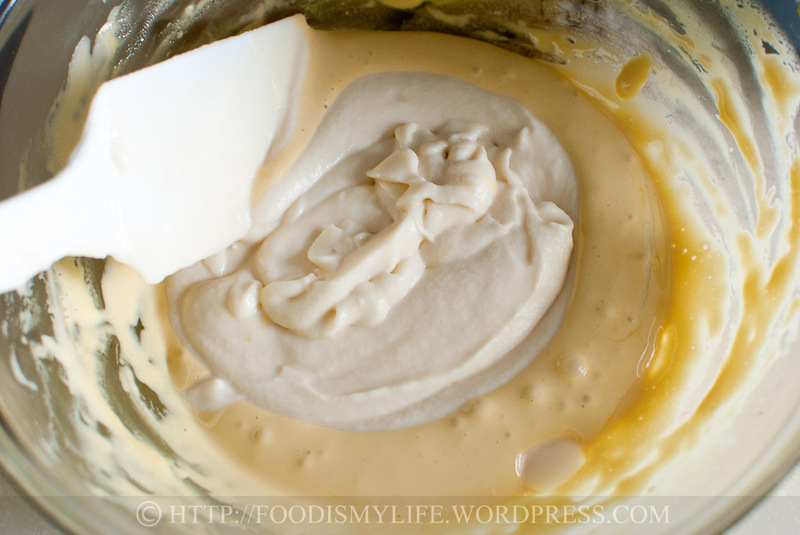 To assemble, use a brush, and dab the genoise with the coffee mix. If using Savoiardi, soak one side in the coffee mix for 2-3 seconds then turn to soak the other side. Place it at the bottom of your favourite serving cup / tin. Spoon some mascarpone mix in. 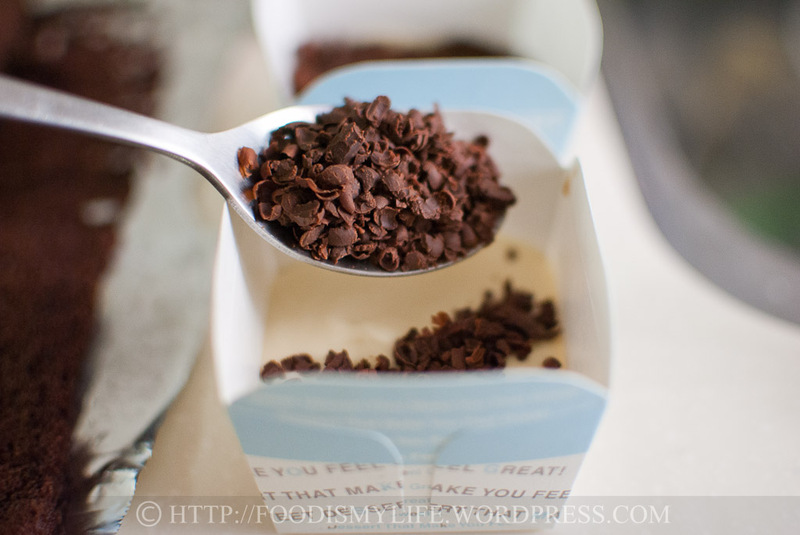 Followed by some grated chocolate. Place another piece of coffee-soaked genoise / Savoiardi in. Spoon more mascarpone mix in and sieve plenty of cocoa powder on top. Refrigerate over night for the flavours to develop. 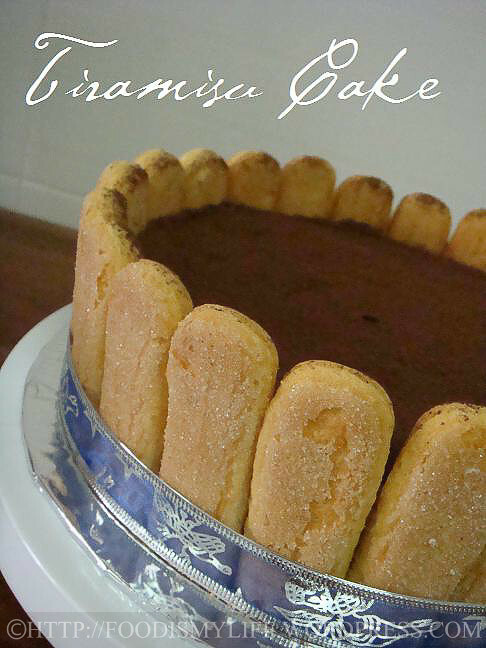 A tiramisu cake that I baked a very, very long time ago! 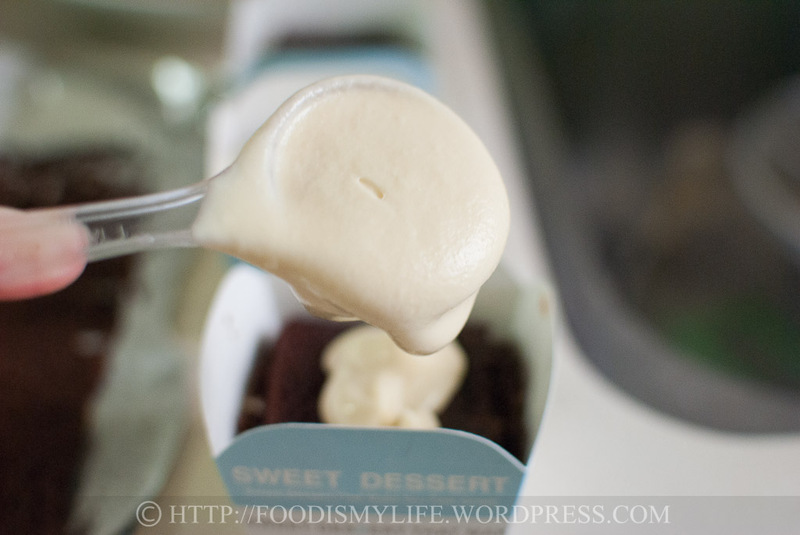 I’m also going to share this with Recipe Box hosted by Bizzy Bakes! 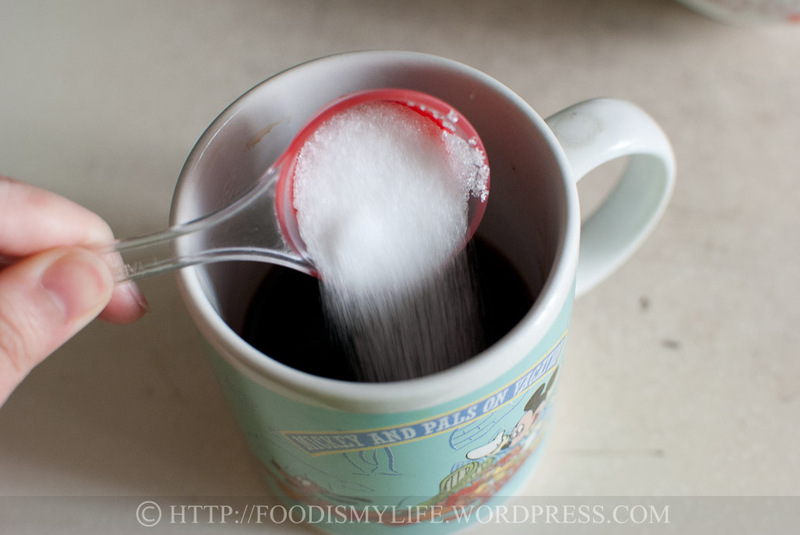 Brew the coffee, and while it's still hot / warm, dissolve the caster sugar. When the coffee has cooled to room temperature, stir in the Baileys. Transfer the coffee to a shallow bowl and set aside. Chill a large mixing bowl and the beaters for 30 minutes until well-chilled. Get an extra-large bowl and fill it ⅓ full with ice water. 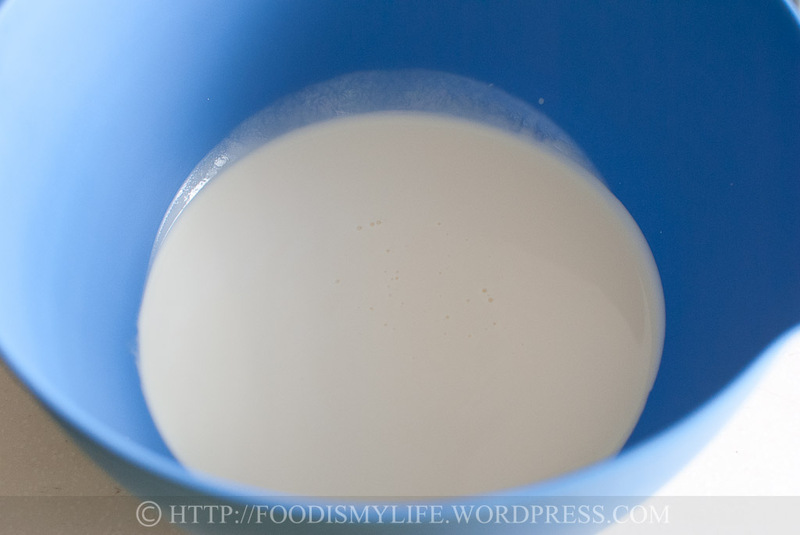 Place the chilled mixing bowl in the water bowl and pour the cream in. 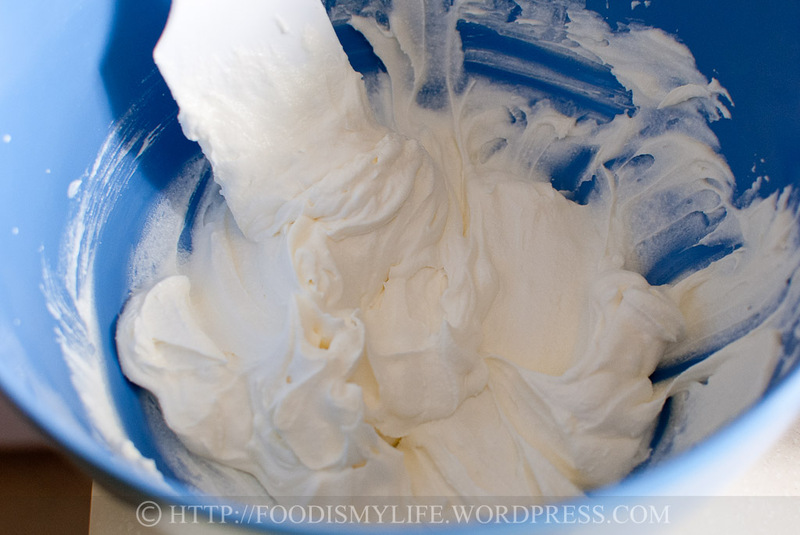 Using an electric mixer, whip the cream on high speed with the chilled beaters until soft peaks form. 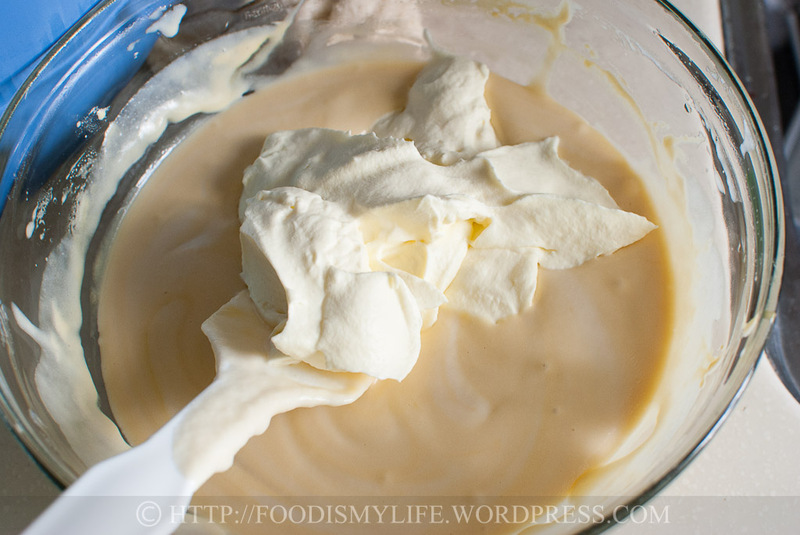 Keeping the cream chilled will help to prevent the cream from splitting and becoming butter and buttermilk. 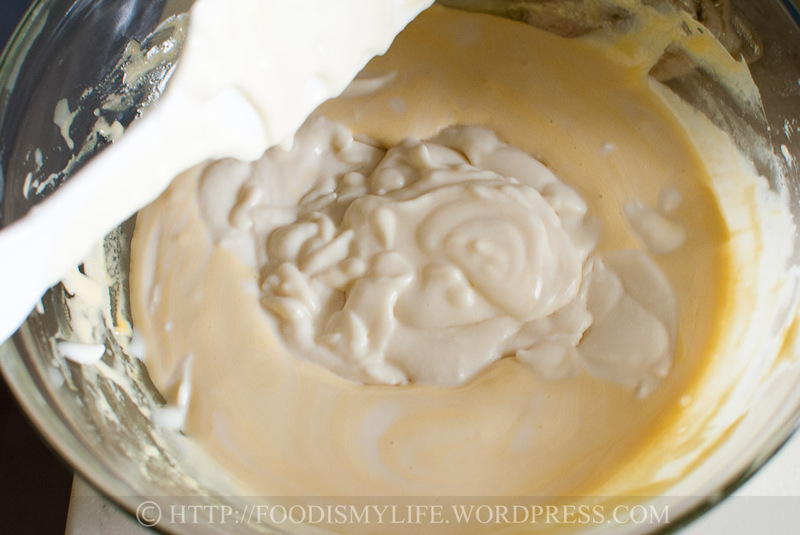 Once the cream splits, there's no way to reverse it, so be careful not to overwhip! Chill the whipped cream in the fridge while you prepare the other components. 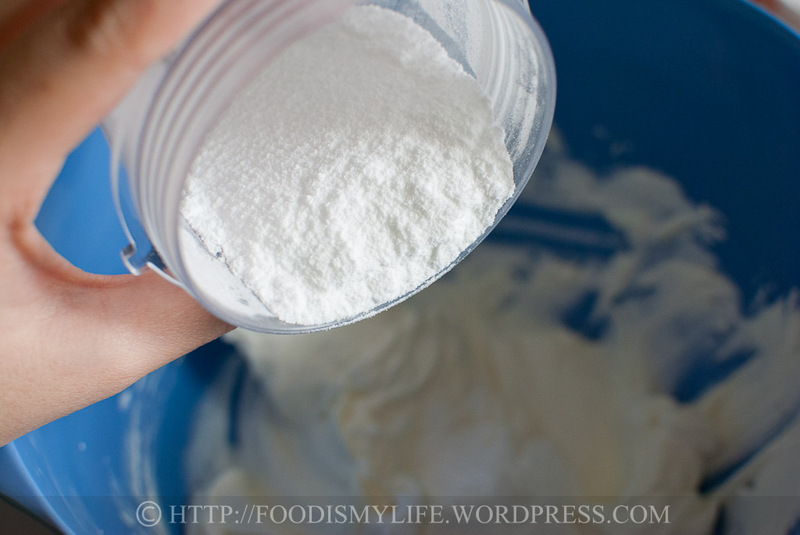 To make super-fine sugar, place 2 tablespoons of caster / granulated sugar in the food processor and process until powdery. Place the mascaropone and super-fine sugar in a medium mixing bowl and beat with an electric mixer until the sugar has been incorporated - don't overbeat as the cheese will become grainy. Stir in the Baileys. Set aside. Fill a small pot with some water and bring to a boil. Turn the heat down to a simmer. 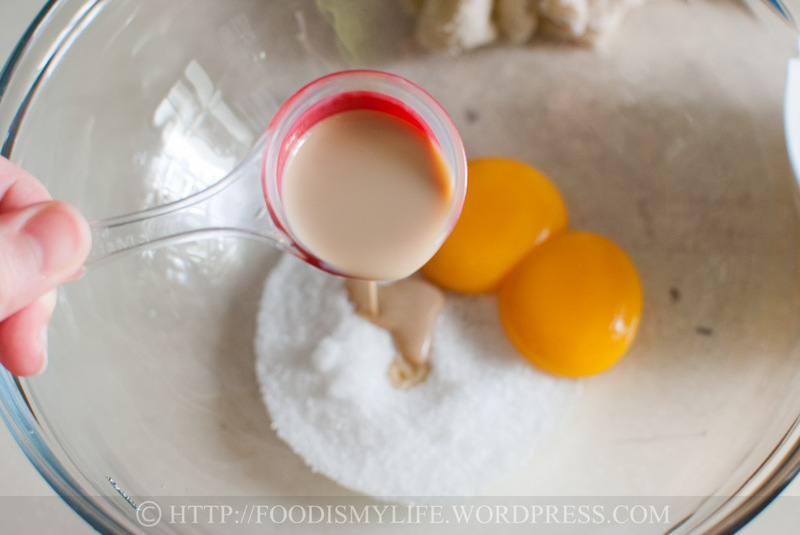 In a heat-proof mixing bowl (preferably glass or metal), combine the egg yolks, sugar and Baileys. Whisk it with a wire whisk slightly combined. Place the mixing bowl on the pot of simmering water - ensuring that the surface of the water is at least 1 inch away from the bottom of the bowl - pour away some hot water if necessary. Fold the mascarpone mixture into the cooled egg yolk mixture, then fold the cream into the mix - fold as gently as possible as you want to retain as much air as you can to ensure a very light and airy concoction. Genoise: Using a brush, dab the genoise both sides generously with the Coffee Mix - the genoise is very soft and very absorbent! Savoiardi: Dip one side of the Savoiardi into the Coffee Mix for 3 seconds, then turn and dip the other side for another 3 seconds (store-bought Savoiardi are not as absorbent as the genoise). Place the genoise / savoiardi in the serving tin. 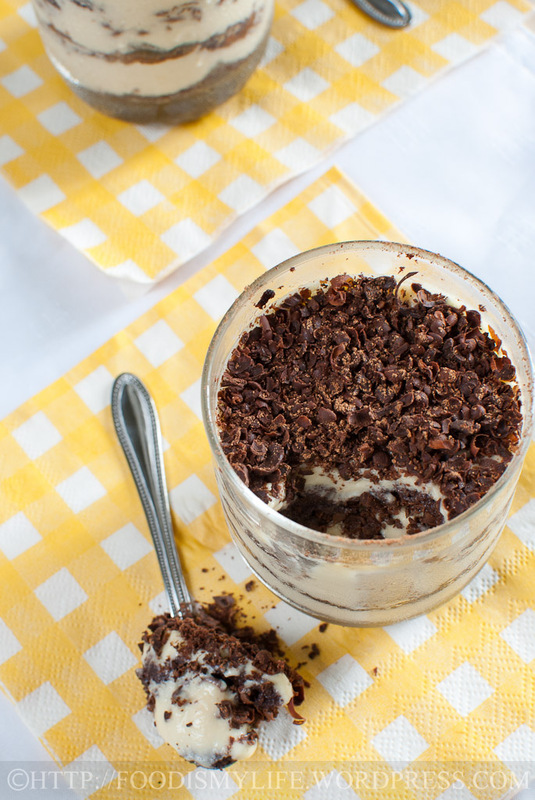 Spread a generous layer of tiramisu-cream mix on top, followed by a layer of cocoa powder and/or grated chocolate. 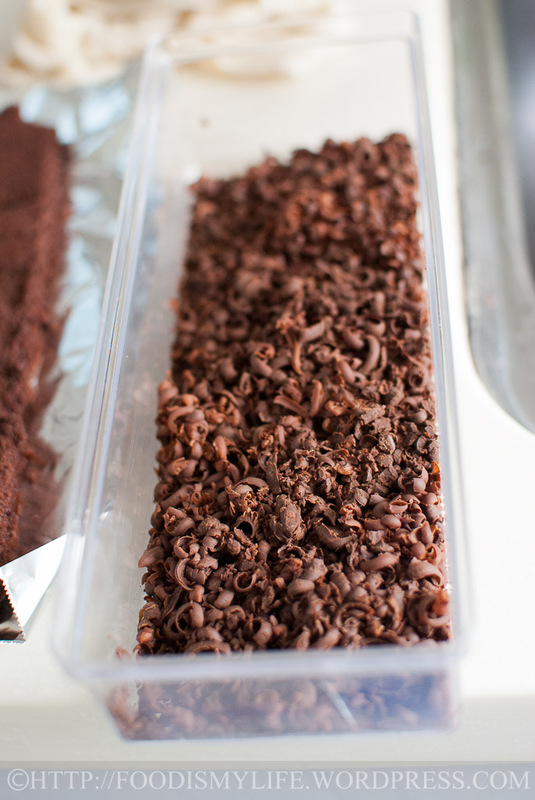 Repeat, ending with a layer of cocoa powder and grated chocolate. 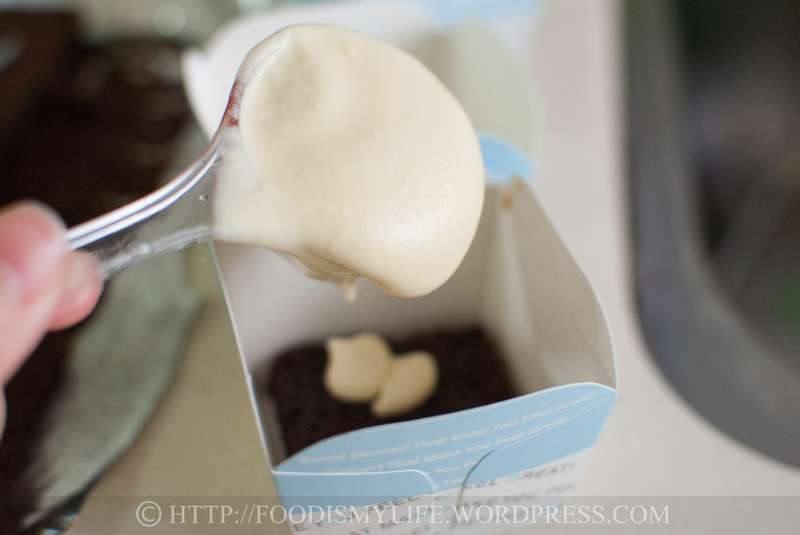 Chill the cake/s in the refrigerator overnight for the flavours to mingle before serving. 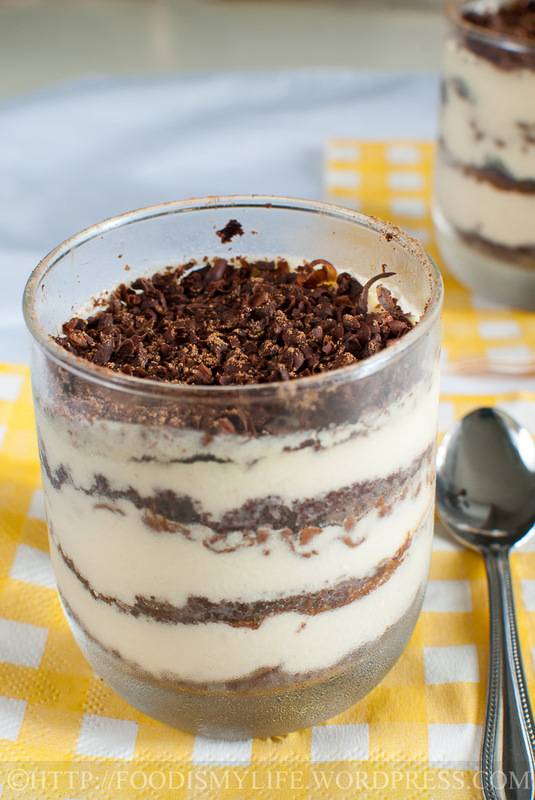 Your tiramisu looks really delightful. I have always been afraid of making and sometimes eating tiramisu cuz it contains raw eggs typically. Noticed yours simmer over a water bath thingy. I wonder if that kinda cooks the egg or not really cuz the heat is not too high? Thank you! I hope you’ll love it as much as I do! this is absolutely gorgeous!!! congrats on your 200th post! What a delicious 200th post! Congratulations! Your photography is stunning! Nice to read all the aspiring baking story about you and glad to know you through blogging. 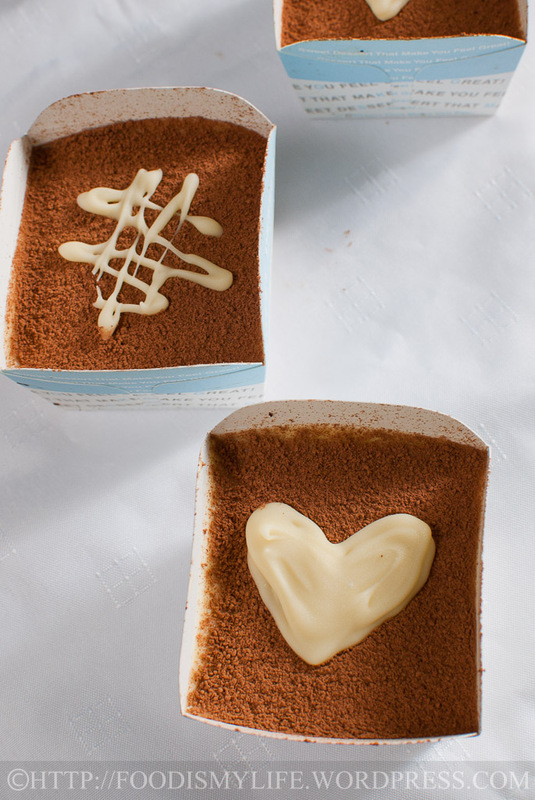 Your tiramisu is such a work of art… I love seeing all your beautiful photos showing all the concise steps on how you made this lovely dessert. Thumb up! I love the little boxed ones they are so cute. I have never tried tiramasu but with all these clear instructions I have no excuse! Congratulations on your 200th post!! though i’m not your reader from your beginning but i have to tell you that you are really talented in your bakes and cooking ..so we can only drool at your tiramisu here? nvr mind, i’m having a glass of plain water next to me, i’m holding the glass now..getting ready to toast…..CHEERS!!! happy 200th post!! Congrats Jasline on your 200th post! You are so young and talented. Keep up the good work. Congrats, please dont close the blog – it would be a waste so much effort and time have been put in. Press on … I know its very time consuming… sometimes I also feel like closing mine. Congrats on a yummy 200th post 🙂 I haven’t been following your blog too long but it’s super awesome and I hope my blog can be as cool as yours on the big two-oh-oh 😀 Thanks for keeping your blog until I discovered it. Congrats on 200 posts! I’m only at 141 and I’ve been blogging 4 years lol That said, so glad to have found your blog, gorgeous photos and awesome recipes! 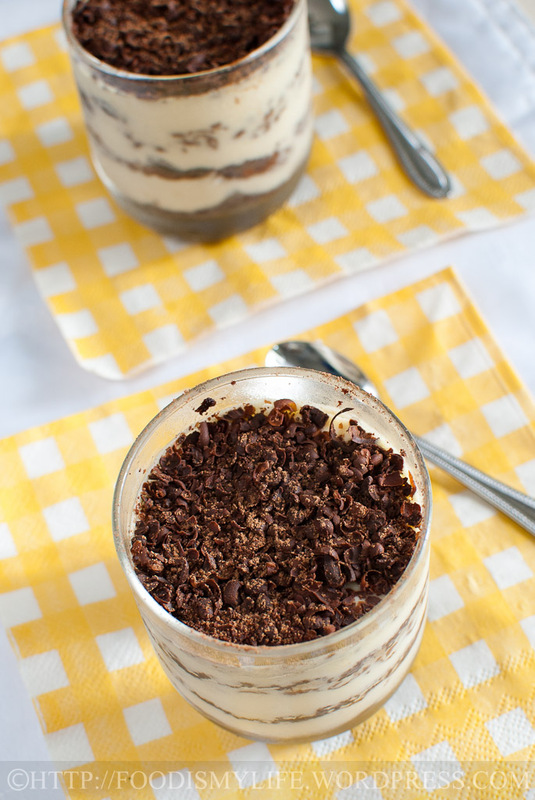 Your takes on the Bailey’s tiramisus’ are phenomenal! Love the verrines! Terrific recipe and tutorial. Your tiramisu must be extra delicious. Between the heat and the abundance of fresh fruit, this is the time for ice creams or sherbets, and cobblers and crumbs. But I’m going to make that tiramisu one day. Thank you for the compliments Smidge! I’m so glad you like it! Thank you for your support all these while Uru! I’m glad you like the tiramisu! Thank you so much 🙂 Oooh do make the tiramisu soon, I’m sure you’ll love it as much as I do! Thank you so much for your compliments, you’re always so sweet! 🙂 I wish I can eat tiramisu everyday, but it’s too disastrous to my waistline! Thank you! I bought them from my local bakery hardware shop, I just couldn’t resist not getting them! Wow glad to see this 200th post, looks amazing and congratulations. Congrats on your 200th. THis dish is perfect to make the occasion and your various presentations are fantastic. Now I’m going to bed hungry for tiramisu. Congratulations dear! You have a great blog and I love your step by step presentation of the recipes. What a way to celebrate 200th post! Congratulations on your 200th post! Glad to have known your wonderful blog! Lovely dessert, Jasline! You have me practically drooling! Yeah, I know what you mean by not (or trying not to) sharing this! I think they won’t last long in my house too! A toast to your wonderful blog! Cheers! Here’s to another 200th post! What a beautiful celebration dessert for your 200thpost! What a lovely series of photos and such a beautiful presentation!! S always, great step-by-step photos. And, congrats on reaching 200 – I’m way behind. 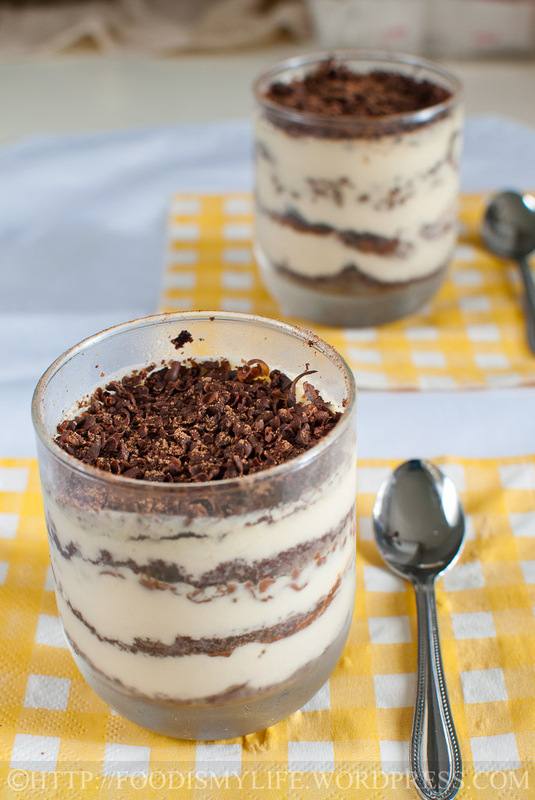 As for the tiramisu, sounds heavenly! You celebrate it wonderfully, I am in awe of your recipe! Congratulations on the 200th post. It’s a beauty and one of my all time favorite desserts. As always the recipe is amazing and your photography is beyond beautiful. Congratulations on reaching the 200th milestone, what an achievement!!! 🙂 I’m so glad you never gave up. Thanks again for sharing all your delicious dishes & beautiful photography with us.